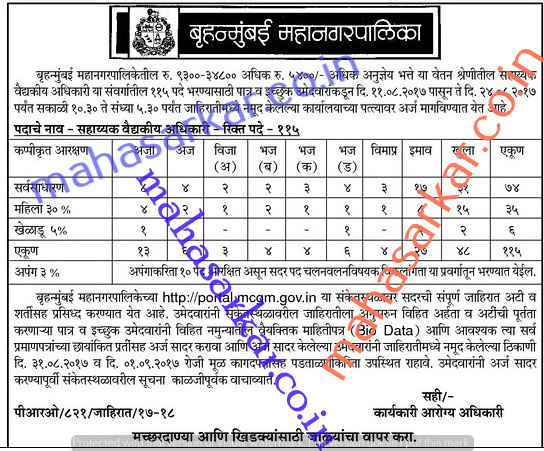 MCGM (Municipal Corporation of Greater Mumbai), Mumbai Published Job Notification for 115 Assistant Medical Officer Posts. Candidates who wish to apply must look at MCGM Assistant Medical Officer Recruitment 2017. Eligible candidates can apply online before 24-08-2017. Education Qualification: MBBS Degree from a university recognized by Maharashtra Medical Council. For Post wise Education Details follow the detailed advertisement. Starting Date, Last Date to Apply Online at Municipal Corporation of Greater Mumbai which candidates should be remember as follows. Start Date to Apply Online: 11-08-2017. Last Date to Apply Online: 24-08-2017.